The bi-annual Australasian Region 8 Pierre Fauchard Academy Breakfast Induction Ceremony took place in April on the Friday of the the 35th Australian Dental Congress in Melbourne. 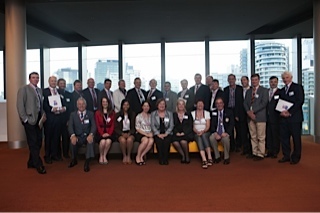 Held at the Melbourne Convention Centre with 120 fellows, guests included Dr Karin Alexander, President of the Australian Dental Association Inc, Associate Professor Neil Hewson, Chair of the Local Organising Committee and Pierre Fauchard Academy Inductee and chair of the Melbourne Congress Scientific Committee, Dr Gordon Burt. 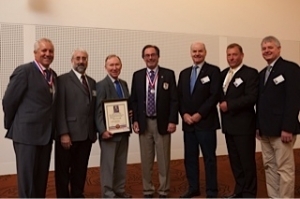 Former International President Pierre Fauchard Academy, Dr William Winspear, and Australian Section Trustees Dr Rick Sawers, Dr Gerry Clausen, Dr Patrick Meaney, Dr Mark Sinlcair Professor Paul Abbott welcomed Pierre Fauchard Academy International President – Elect Dr Dan Castagna and his wife Debra from San Francisco. 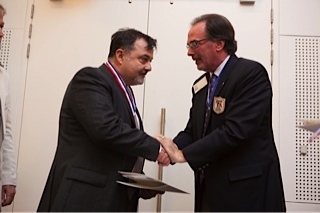 Dr Castagna spoke to the Fellows and Inductees discussed the activities of the Academy and its Foundation. Dr Castagna welcomed the 27 new inductees present (a further 18 were inducted in absentia). 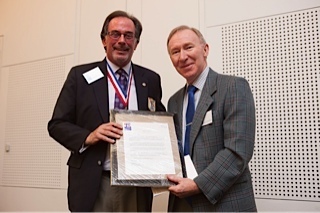 The meeting awarded Honorary Life Membership to Professor Roland Bryant from New South Wales. Professor Bryant has been a dental academic at the University of Sydney for over 40 years and now shares his time between Charles Sturt University Faculty of Dentistry at Orange and the University of Sydney teaching clinical restorative dentistry. He has devoted an enormous amount of his life to ensuring that our new graduates develop with the best clinical base and a strong standing in ethics and professional practice. The Breakfast and Induction immediately preceded an Academy project, the National Emerging Lecturer Competition. Young dental graduates with an interest in both postgraduate education and a desire to lecture on any number of subjects entered the competition. Six lecturers covered in disciplines included endodontics, orthodontics, prosthodontics and statistical analysis. 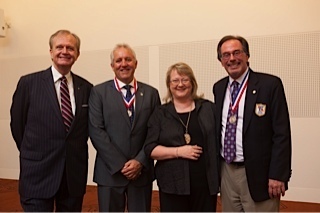 Four judges were selected, 2 from the Academy including President-elect Dr Dan Castagna and 2 provided by the Australian Dental Association Inc. The final announcement was made at the conclusion of the Congress with the winner being Dr Nour Tarraf who gave an outstanding presentation on mini implant screws as a form of orthodontic anchorage. Dr Tarraf was awarded a cheque for $5000 from the Academy and invited to present in the main congress program at the 36th Australian Dental Association Congress in Brisbane on 2015. Encouragement awards were also presented to Dr Danielle Layton, and Dr Kunal Pandya. The Academy will sponsor the National Emerging Lecturer Program at future Australian Dental Congresses. The Academy will again convene in conjunction with the Brisbane Congress in 2015.